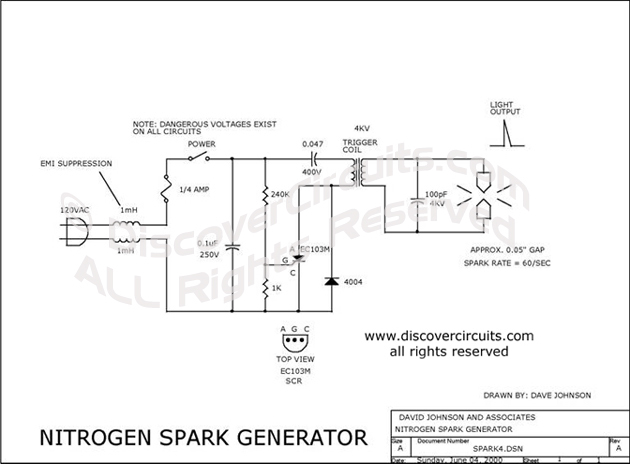 Circuit: s: IMPLE NITROGEN SPARK GENERATOR __ Circuit designed by David A. Johnson, P.E. Nitrogen or air sparks are very powerful light sources that produce flashes that last only a few nanoseconds. This line-powered circuit generates a continuous series of very small sparks across electrodes with a 0.05-inch gap.